Hello! How was your weekend? As you already know yesterday it was Valentines day. I had nothing on my planning so for me it was just another Saturday, until the doorbell rang. The mailman gave me a tube and all I could think was 'What did I ordered?'. I was totally surprised when I opened the tube cause I didn't expect this beautiful red rose inside! A spontaneous smile appeared on my face, someone thought about me on this day. Who was it? A little card made everything clear, it came from the Zalando mail deliverer! This is so sweet! It's the sweetest thing I've ever received on Valentines day. Normally I'm not into Valentine and I just ignore it but I have to admit: this rose really made my day! So in this way, dear Zalando deliverer I want to thank you for the beautiful rose. I'm honored that you're a follower of my blog and of course this love is mutual. In some way I always end up at your site and every time again you fulfil my wishes. To answer your question about the perfect Valentines gift: I always ask things that I need and at this moment I need Moon boots in size 39 for long walks through the snow but to be honest, Moon Boots aren't really a romantic gift. 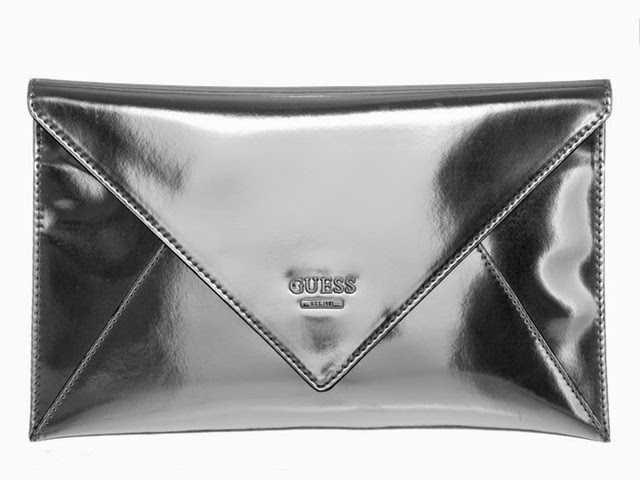 The perfect Valentines gift has to be feminine like this beautiful silver clutch from Guess! Have a lovely day! Did you received anything on Valentines day? Tell me!